Curious to see which games will support the latest in PC graphics wizardry, DirectX 11? 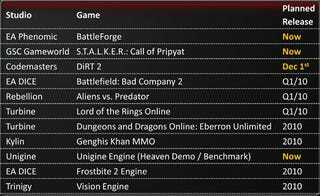 There's no better place to look than this list provided by AMD. Most are games (including Battlefield: Bad Company 2), but as you can see, a few towards the end are just for engines, meaning we can expect future games - whatever they may be from DICE or anyone using the Trinigy engine - to support the new tech.